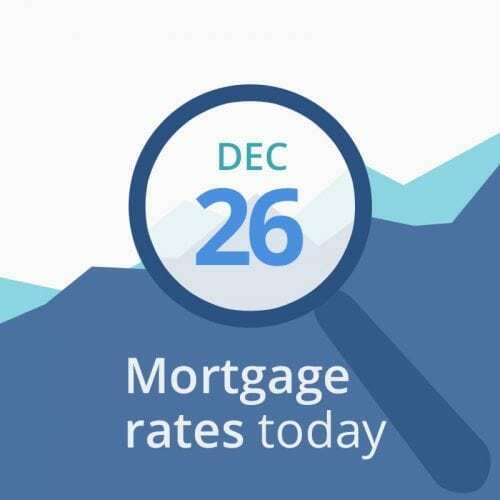 Average mortgage rates today edged slightly lower, continuing recent trends. The only report we received today was only moderately important, the Case-Shiller home prices for October. It showed slowing in housing markets, but the data are two months old and did not impact mortgage rates much. HOWEVER, the stock market stormed back after weeks of weakness, with the Dow recording its best gain ever, 1,086 points. Experts attribute this to after Christmas bargain hunting by investors seeking to take advantage of basement-level prices. Whether this trend is sustainable remains to be seen. When trading is light, small events can have a larger impact — so if you are floating a rate, stay on top of the news and in contact with your lender. It’s unlikely that we’ll see large movements, but if we do they will happen fast. All major numbers reversed their courses and point to rising rates. Today’s data point to higher mortgage rates, but markets are unstable. You can probably float a day or so if that will get you into a better tier (for instance, drop from a 45-day lock to a 30-day, or a 30-day into a 15-day lock). If closing soon, current rates are attractive enough to feel good about.